Holly Reed joined the Masters of Occupational Therapy Faculty at the University of St. Augustine in San Marcos in November 2011 as the Academic Fieldwork Coordinator. 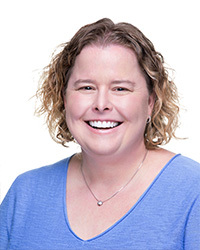 Holly completed her Doctorate in Educational Leadership at San Diego State University in December 2014, with dissertation research on the use of simulation as a collaborative alternative to level I fieldwork for occupational therapy students. She received her Masters of Arts in Occupational Therapy from the University of Southern California in 1999 and her Bachelors of Science in Psychology from Arizona State University in 1997. Prior to starting at USA, Professor Reed was the academic fieldwork coordinator for an Occupational Therapy Assistant program at Grossmont College in San Diego. While at Grossmont, she worked on scenario based learning experiences for students while teaching the courses in adult roles and aging and in rehab terminology. Professor Reed’s primary practice area is in pediatrics with a focus on adolescents and young adults in transition to adulthood. She came to this practice area as she was working for various school districts in the San Diego area over the past 13 years. Currently, she is supervising as the lead supervising OT at a local non-public school. At USA, Professor Reed teaches courses in foundations of occupational therapy and clinical reasoning, as well as being the coordinator for all fieldwork placements and coursework for the San Marcos campus.